Tater Tots — which Ore-Ida founders F. Nephi Grigg and Golden Grigg invented in the 1950s — transport me right back to my elementary school cafeteria. Those golden-brown tots evoke nostalgia and comfort -- and Greater Cincinnati restaurants like to smother them with cheese, bacon and everything else imaginable. Let’s be honest: Most bars and restaurants serve tots of the frozen variety. (Many local establishments use the Lamb Weston brand.) However, the gold standard is made-from-scratch tots, which a lot of restaurants are now employing. From a taco joint to pizza parlors to a fine-dining hotel restaurant, here are some Greater Cincinnati eateries that present a solid Tater Tot game. In January, national beer bar chain Brass Tap opened a location in Florence, Kentucky, joining the original U Square location. Both places proffer house-made tots on their menus. You can get a full order loaded style — topped with bacon, beer cheese, peppadew peppers and a cilantro-onion mix — or as a naked side item. The gumdrop-shaped tots are spongy to the touch but exude a slight crunch. The tots complement the Tap’s also house-made hush puppies, another joyous fried spherical food. Tots are $6 instead of $8 during happy hour. Pizzerias Adriatico’s and Mac’s Pizza both feature tots (but, alas, not as a designated pizza topping). At Adriatico’s, tots come as a side or full plate, with the options of messy melted cheese, bacon, pizza toppings and ranch or sour cream. The tots are dark-brown and extra crispy, and the cheese doesn’t make the outer shells too soggy. Mac's offers similar toppings, including homemade ranch dressing drizzled on top. Pairing New York-style pizza and tots isn’t the most nutritious meal, but it’s a satisfying duo. The “epic tacos” and whiskey-tequila Covington restaurant loves to put tots on a few of its tacos, including the Angel’s Share (fried egg, tots, maple bourbon bacon beans and “more bacon”) and the Snitch (beer-battered cod, tots, pea mash, malt vinegar and tartar sauce). (Customers also can order tots as a side.) But why tots on tacos? Coppin’s, located inside Hotel Covington, lists tots as a side dish on its dinner menu, but it’s in quotes because these aren’t your typical tots — they’re better. Sous chef Alex Jepson takes thinly sliced Idaho potatoes mixed with cream and butter and layers parsley, Parmesan cheese, garlic and onion powder between the slivers. The potatoes are baked until crispy, then weighted down with a pan and sliced. The result: rectangular bites with striations and a lightly cheesed center. The “tots” are served with a condiment made with Duke's mayonnaise and spicy chili flakes. These potatoes are so good, you might consider ordering multiple rounds. Board game parlor/bar the Rook OTR knows gamers enjoy tots. Like its pizza rolls, the Rook’s tots are made from scratch and stuffed with various ingredients, such as sausage and fragrant sage, Buffalo chicken and bacon; you also can get them plain. The eight tots, surrounded by somewhat edible spinach, look like mini egg rolls and require a knife and fork to eat. The sausage-sage tots come with a cup of maple syrup, which makes the entire dish taste like breakfast (these tots are also offered during the Rook’s weekend brunch). During happy hour, tots are a dollar off. Every Friday through the end of Lent, chicken restaurant Revolution Rotisserie is serving fried fish with a side of tots at its Over-the-Rhine and Pleasant Ridge locations. Revolution Rotisserie already includes tots in its poutine — tots, chicken, semi-melted cheese curds and gravy — and as a side basket; this is yet another option. For Sunday brunch, try the breakfast poutine tots — ham, cheese curds and hollandaise sauce — alongside bottomless mimosas . Besides burgers, Nation Kitchen and Bar in Pendleton also specializes in tots. Its potato program includes choosing from either regular tots, fries or sweet potato tots and then piling on ingredients. Get the taters loaded (cheddar, bacon, green onion, ranch), Queen City-style (chili, shredded smoked cheese), totcho (queso, jalapeños, pico, taco meat, ranch) or plain. The tots come in “table” or “sidecar” sizes. 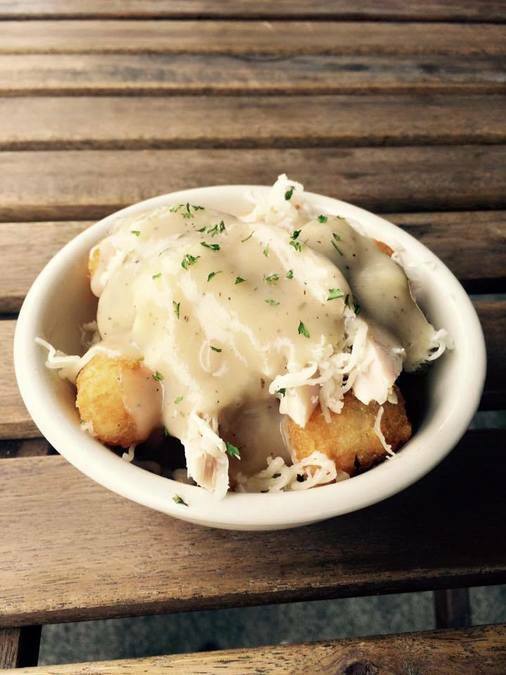 On weekends, Nation offers breakfast tots — cheese, sausage gravy and a fried egg — and unlimited mimosas. When Taft’s Ale House opened in Over-the-Rhine in 2015, it was known for tri-tip steak. However, since then its tots have become equally popular. The appetizer portion comes loaded with beer cheese (using Taft’s 27 Lager beer), jalapeños, bacon, green onions and sour cream. The side version comes traditional, with $2 extra for beer cheese. Across town at the Spring Grove Village location, the Brewpourium offers “apizza” (New Haven style) and the same loaded tots as Taft’s Ale House.